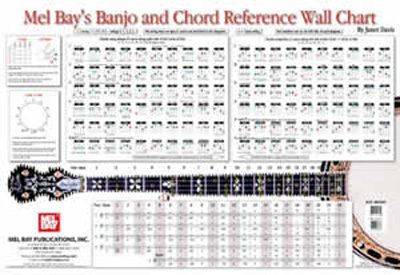 Full-size wall chart featuring chords and notes on the fretboard for banjo in G tuning. Major, minor, 7th, maj7, min7, 6, 9, augmented and diminished chords are shown. Chords are shown in a Circle of 5ths progression. Chord fingerings are color coded to show proper finger placement.